Christmas Dance 2017 | | Senior Centers, Inc. Decorated Cookies (decorated by our ladies’ group), cocoa, punch and dancing! What a festive way to celebrate the holidays with friends. We had a DJ spin some dancing tunes mixed with some Christmas songs young and old. 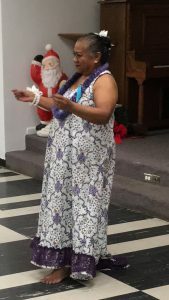 Our ladies’ sewing group also made handmade fleece scarves for everyone.Loretta Neubert entertained us with a beautiful hula dance to the song “Christmas With You”. Loretta is such a talented artist! She even made her own costume just for the occasion. December 20, 2017in Crafts, Entertainment, Fun, Images, Parties, Uncategorizedby Senior Centers Inc.